As far as we know, our family originated at or around Ocilla, Georgia. Epharim Paulk, our relative, operated a successful business in Ocilla, employing blacks and whites. Because of this, jealousy arose and there was a shoot-out – Epharim was killed. As a result of this incident, Tom Paulk decided to move his family elsewhere. From their home in Ocilla, Georgia, they started their journey, traveling with mule and wagon. During the course of their travel, they stopped at a place called Caney Creek. Aunt Lou Gene fried fish over an open fire. In 1905 Handy Tomberlin, Tom Paulk, and Dennis Tomberlin came to this community. Shortly after they settled here, one acre of land was given to Glenn and Winnie Tomberlin to bury their infant son, Little Buddy. The cedar tree that stands in front of First Pleasant Hill serves as a marker for the burial place of this infant. Elliot Mims donated one acre of land and an additional acre was purchased. A building was erected for worship service; this church was named First Pleasant Hill Baptist Church. Many offsprings were born to these families. As the children grew, married and moved away, Aunt Emma Sumner yearned to see the family united again in means of a family reunion. Warnell Riley took the initiative to see the dream come alive. In January 1976, she called a meeting. Warnell along with Necholus and Dorothy Ogden came from Atlanta and met at Uncle Vernie (Dude) and Carrie Bell Tomberlin’s home. Others who met with them were: Bobby Sumner, Minnie Ogden, Elmina Paulk, Moses Ogden. This was a night of fun and laughter, as plans were finalized for the first reunion. A date was set and the first Paulk and Tomberlin Reunion became a reality. Uncle Dude gave the first history and Uncle Tiny preached the first reunion sermon. 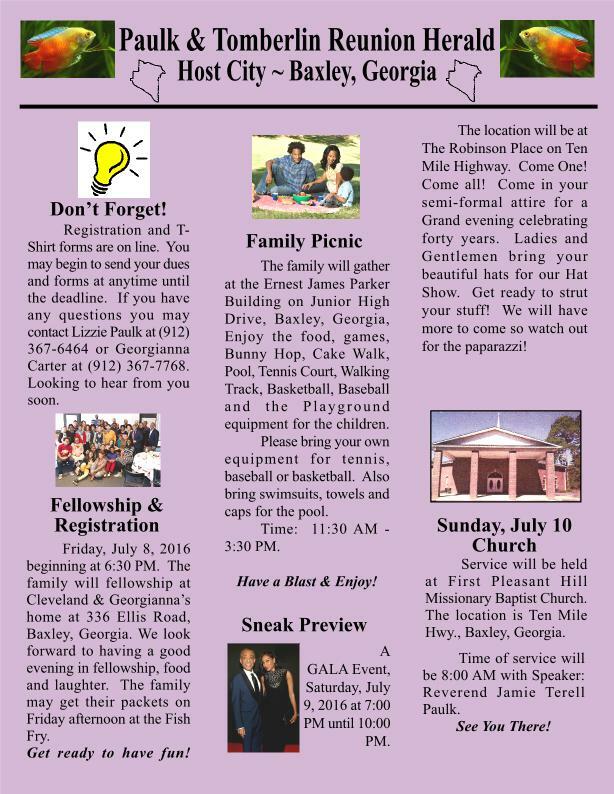 For ten consecutive years the reunion was held in Baxley, Georgia. In 1986, the family agreed to move the reunion to other places, with the understanding that the reunion would return home every other year. Families in Atlanta, Georgia, Huntsville, Alabama, Orlando, Florida, Norwalk, Connecticut, West Palm Beach, Florida, Warner Robins, Georgia and Mesa, Arizona, have hosted the reunion. Melvin Eugene Paulk, Jr., better known as Nip, was born on October 7, 1940 in Baxley, Georgia. He is the eldest child of the late Melvin and Elmina Paulk, who had a total of 15 children. His siblings are Lester (deceased), Robert, Queen Ella, Carnell, Milton (deceased), Lennis, Alonda (deceased), Sandra (deceased), Donnette, Dale, Perlie, Elaine, Mitchell, and Rozell (deceased). His paternal grandparents were George and Winnie Paulk. His maternal grandmother was Queen Sead. Nip’s early childhood education began at Ten Mile School in Baxley, Georgia. His education was cut short when he had to drop out of school to help with the family farming. Nip’s professional career began in 1963 at the Baxley Creosoting Company. He worked there for many years before becoming an entrepreneur of a successful trucking company. Nip named this company Ten Mile Trucking. Anyone who knows Nip isn’t surprised to know that his favorite pastime is FISHING! Second to that is his love of helping others. Nip is a loving father of three daughters, Dorothy “Tweety Bird” Williams, LaSharon “Prissie” Lee, and Annie “Margie” Williams (deceased); and two sons, Carlos “Pete” Paulk (deceased) and Julian “Snoopy” Paulk. He has three granddaughters, Ebony Williams, Tameika Williams and Londyn Paulk; and six grandsons, Herbert Williams, Derrick Williams, Curtis Williams, Craig Lee, Jr., Joshua Lee, and Julian Paulk, Jr. In addition, he is the great grandfather of nine grands. Nip is loved by his church family. He has been a long time faithful member of the First Pleasant Hill Baptist Church for over 50 years. He loves to tell the story of being baptized in a ditch after a heavy rainfall. He showed signs of leadership at an early age. He became a deacon of the church in his early 20’s, and held that position throughout his late 50’s. Other positions he held were Sunday School Superintendent and Ward Leader. He was also blessed with the gift to sing, which was one of his favorite pastimes. This gift led him to join the church choir, as well as a male quartet. Nip is currently at the Unihealth Care Center in Austell, GA after suffering a stroke in July 2012. He is slowly recovering but getting stronger each day. The family asks that you continue to keep him in your prayers. Paul was born on July 1, 1954 in Baxley, Georgia. He is the third child of Harvey and Eunice Mae Ellis Williams, who had a total of seven children. His six siblings are Aggie “Lynn” Verlinda (deceased), Daricile, Eunice, Revenia (deceased), Hazel, and Ellis. Although Paul has six biological siblings, the family has "adopted" Hazel's college classmate, Inetta Jackson, as a sister. His maternal grandparents were Herbert Ellis and Sarah Ann Tomberlin Bell. His paternal grandparents were Arthur and Hazel Howard Williams. Paul’s early childhood education began in the Appling County school system. He graduated in 1971 from Appling County High School where he was a star athlete in football, basketball and track. Paul’s senior year was the first year of integration in the Appling County school system. Upon graduation, he attended Albany State College on a football scholarship. He studied there for a little over 1 year, majoring in education. Paul’s professional career began in 1973 with Georgia Power as an Apprentice Cement Finisher during the construction of the Nuclear Plant in Baxley, Georgia. After two years he moved to Wilmington, Delaware where he worked in the carpet industry with Amoco Chemical Plant on their assembly line. He returned to Baxley a year later and continued construction work for several months at the Nuclear Plant as a labor union worker with the Union Laborer Hall based in Brunswick, Georgia. In late 1976, Paul's career guided him to Jacksonville, Florida where he worked as a truck driver for six years with Cooper Distributors, covering the east coast which included Florida, Georgia and South Carolina. Once again, Paul returned to Baxley, Georgia. This time he joined Cleveland Carter's trucking and construction business, Cleveland Carter Enterprise, where he worked for two years traveling throughout Georgia; and again from 1991 until 1995. In 1988 he went back to Wilmington, Delaware and drove the city bus for Delaware Area Regional Transit (DART) until 1991. While there, he met and married his first wife. In 1995, Paul moved to Savannah, Georgia and began working for several trucking companies until 2005 when he joined the Tsay Ferguson Williams (TFW) company, a contractor for the military. Today, Paul continues to work for TFW as a Heavy Equipment Operator, covering the military base at Fort Stewart & Hunter Army Airfield. Paul’s hobbies include reading, attending sporting events, walking, and watching movies. Paul has a loving adopted daughter, Shanada Michele German. He is happily married to his second wife, Vickie Lovelace. They will celebrate their 16th wedding anniversary on February 21, 2014. They are parents to Vickie’s two sons, Demesheo Lovelace and Duramus Lovelace. They have one grandson, Demesheo Lovelace, Jr. and three granddaughters, Dejanira Lovelace, Dejaree Lovelace and Kyleah Clark. Also, years ago, Paul and Vickie served as legal guardians of India Lewis until she was 5 years old. Paul has been an active member of Litway Missionary Baptist Church in Savannah, Georgia since 1998, pastored by Dr. Leonard Smalls. Paul currently serves as the church's Assistant Sunday School Superintendant and Chairman of the Trustee Board. Also, he is grateful to be a member of the Brotherhood organization within the church which lectures young boys. Dorothy was born on March 12, 1953 in Baxley, Georgia. She is the eleventh child of Vernie (Dude) and Carrie Bell Williams Tomberlin, who had a total of fourteen children. Her thirteen siblings are Birdie Bell, Willie C. (deceased), Joe Louis, Jureal (deceased), Levern, Louise (deceased), Sammy, James, Jerelene (deceased), Eugene, Deron (Nick), Annie Lois and Rita Faye. Her paternal grandparents were Glenn and Winnie Paulk Tomberlin. Her maternal grandparents were Dock and Bettie Wade Williams. Dorothy’s early childhood education began in the Appling County school system. She graduated in 1971 from Appling County Comprehensive High School. Upon graduation, Dorothy attended Waycross Ware Technical College, earning an Associate of Arts degree in early childhood education. Later, she took courses at Brewton Parker College to expand on her early childhood education career study. Dorothy’s professional career began in West Palm Beach, Florida at the Palm Beach County Housing Authority where she worked as a secretary for approximately two years. Eventually she moved back home to Baxley, Georgia and began a career as a teacher with the Appling Daycare Center. A few years later, she became Director of Head Start for the Appling County Head Start program and held this position for ten years. In 1986 Dorothy was employed by the Appling County Board of Education as a Para-Educator. She continues to hold this position today. Dorothy has a passion for working with children. In addition to teaching in the public school system, she teaches 7 to 11 year olds every fifth Saturday through the Second Rehoboth Baptist Association of the Congress of Christian Education, an organization that offers a wealth of learning opportunities to help individuals grow spiritually and in their work for Christ. Dorothy’s hobbies include reading, creative writing, walking/exercising, and listening to jazz and spiritual music. Dorothy has no children but she assisted in raising her nephew, LaShaun and niece, Tameka. Also, she is the Godmother of her niece, Jalyn Nicole Buchanan who is currently a senior at Eagles Landing High School in McDonough, Georgia. Robin was born on March 22, 1962 in Hazlehurst, Georgia. She is the third child of Evrod and Birdie Bell Tomberlin Scott, who has a total of six children. Her siblings are Brett Maverick, Wendell Donnell, Sherrie Renae, Bruce Edward and Carol Wennett. Her maternal grandparents were Vernie and Carrie Bell Williams Tomberlin. Her paternal grandparents were Alvin Scott and Jalanie Blanding Scott Rainey. Robin’s early childhood education began in the public school system of Jeff Davis County in Hazlehurst, Georgia. Upon graduation she attended Clark College (n/k/a Clark Atlanta University) in Atlanta, Georgia where she earned a B.A. degree in Accounting. Robin’s professional career began in 1984 at Days Inns of America in Atlanta, Georgia where she worked as an Accounting Clerk. During her eight-year stint with the company, Robin received several promotions, advancing to Sr. Accountant. Also, while with Days Inns, she coordinated hotel stays for the Atlanta group during several out-of- town family reunion trips. In 1982, Robin joined Morehouse Medical Associates (MMA) as a senior level accountant. Seven years later she joined MMA’s parent company, Morehouse School of Medicine, as a Financial Analyst. She currently serves as a Department Administrator for one of the basic science departments within that organization. Robin’s favorite hobbies include baking, tennis, and crossword & jigsaw puzzles. Robin has one child, a son Sterling Gerald Truitt who is a student at Georgia Southern University in Statesboro, Georgia. Patricia was born on April 15, 1950 in Bridgeport, Connecticut. She is the second child of Artie and Vernell Wooten Tomberlin, who had five children. Her four siblings are Artie Glenn, Versie Lee, Eleanor, and Vanessa Rose. Her paternal grandparents were Glenn and Winnie Paulk Tomberlin. Her maternal grandparents were Gilbert and Cornelius Cross Wooten. Patricia’s early childhood education began in the public school system of New Britain, CT. Her high school years were spent at E.C. Goodwin Technical School where she concentrated in fashion design. Upon graduation, Patricia spent a year studying fashion design at Broadway School of Fashion Design in Manhattan, NY. Years later she moved to West Palm Beach, FL continuing to advance her education; first earning an Associate of Arts (AA) degree from Ft. Lauderdale College in 1982. Followed were a Bachelor of Arts (BA) degree in Liberal Studies at Barry University in March 1995 and a Master’s degree in Professional Studies in Human Relations in August 1997. In 2000, Patricia successfully reached her education goal by earning a Doctor of Philosophy (PhD) degree in Metaphysics. Patricia’s professional career began in 1976 at Stanley Works in Farmington, CT where she worked in the company’s accounts payable department for 2½ years. In August 1979, she moved to West Palm Beach, FL and continued her career in accounts payable with Northern Telecom for approximately 3 years. In 1983, Patricia began working in the real estate business with her cousin, Joe Louis Tomberlin, as an office manager. She was employed there for 2½ years before joining the Florida Power and Light Company as an administrative assistant. It wasn’t until ten years later that Patricia began a career in an area that allowed her to do what she loves most; and that is helping others. This career path began at the Department of Juvenile Justice as a Case Manager Tracker for 1½ years. In 1998, she gained employment with the School District of Palm Beach County where she served as a Behavioral Intervention Assistant, and one year later as a Guidance Counselor. In 1999, Patricia joined the 45th Street Mental Health Center as a Mental Health Therapist. While there she also served as a counselor for adults and school children. A year later she worked as a therapist at the Panda Program in Belle Glade, FL, which serves as a treatment center for women with children. In 2001, Patricia retired at the age of 51 to become an entrepreneur. She designed clothes and started a soap and creative craft business. In addition to operating her business, Patricia worked as an independent contractor serving as a therapist for disabled Medicaid clients. In 2005 she began writing. She has written six children’s books of which two are published. They are entitled Play Pals and Play Pretty . In addition, she has two published adult books entitled, Sonnets for the Soul and Within A Quiet Spirit . All of which can be purchased on Amazon.com . Patricia continues to write in her spare time. Patricia’s favorite hobbies include reading, sewing, writing, singing and jigsaw puzzles. As a young adult, she put her singing to the test as a member of a gospel group that included two of her sisters, an aunt and a family friend. Patricia has two children, daughter Tomeko Lynn Heard and son Lawrence Nicholas Tomberlin-Nixon. She has two granddaughters, Tatiana Heard and Tifanye Jones; and one grandson, Trenton Exum. Joe Louis was born on June 22, 1937 in Baxley, Georgia. He is the third child of Vernie (Dude) and Carrie Bell Williams Tomberlin, who had fourteen children. His thirteen siblings are Birdie Bell, Willie C., Jureal, Levern, Louise, Sammy, James, Geralene, Eugene, Dorothy, Deron (Nick), Annie Lois and Rita Faye. His paternal grandparents were Glenn Tomberlin and Winnie Paulk Tomberlin. His maternal grandparents were Dock and Bettie Williams. Joe’s early childhood education began at Pleasant Hill School in the Appling County school system. He continued his high school education at Baxley Training School through the 11th grade. Because he was required to work on the farmland, Joe was not fortunate to complete his high school education. Joe remained in Baxley working in the Turpentine business until the age of 21. He moved to West Palm Beach, FL with relatives and began a career in construction. He later joined the staff of Graham Eckes Private School in Palm Beach as a butler. During this time he spent three summers attending sailing school. After two years as a butler, Joe decided to put his sailing expertise to good use. He remained at the private school and transferred to their sailing program. There he taught wealthy kids of Palm Beach how to sail and row. After 17 years at the private school, Joe became an entrepreneur and started a landscaping and lawn maintenance business. He sold this business after approximately 15 years and transitioned into the real estate business until his retirement at the age of 70. Joe’s favorite hobbies are golf and sailing. Joe Louis has been happily married to Frances Bennett Tomberlin for 56 years. Warnell was born on July 7, 1935 in Baxley, Georgia. She is the sixth child of Barney Sumner and Emma Tomberlin Sumner, who had nine children. Her eight siblings are Minnie, Ruth (deceased), Addie, Artie (deceased), Eldredge (deceased), Lynwood (deceased), Doris (deceased), and Bobbie Dale. Her maternal grandparents were Glen Tomberlin and Winnie Paulk Tomberlin. Her paternal grandparents were Freeman Sumner and Ella Golden Sumner. Warnell’s education began in the Appling County school system. Upon graduation she attended nursing school at the University of Buffalo where she earned her Licensed Practical Nurse (LPN) degree. Warnell’s career started as a LPN (Licensed Practical Nurse) at Roswell Cancer Research Center in Buffalo, NY. She worked there for approximately two years and was later hired as the first African American nurse for maternal and infant care at Planned Parenthood in Buffalo. This followed a 5-year stint at Buffalo Veterans Affairs (VA) Medical Center. In order to be closer to her ailing father, Warnell moved to Atlanta where she continued her career as a LPN at the Atlanta VA Medical Center until her retirement. Warnell’s favorite hobbies are fishing, flea market shopping, and cooking. Warnell raised three daughters, Princetta Sumner, Gale Sumner Hosley and Stephanie Riley. She has two granddaughters, Monique Sumner and Andrea (Meika) Mackey Robinson; and two grandsons, Travis and Tyler Hosley. Want to be one of our monthly profiled family members? Click here. We need your family photos! Do you have a business? If so, click here.